Internationally acclaimed Chinese art master Huang Yongyu is known for his woodblock prints, ink paintings and literary works. A multi-talented man, Huang has published poems, essays, novels, screenplays and photo albums. A prolific carver of wooden engravings, he has held exhibitions in <?xml:namespace prefix = st1 ns = "urn:schemas-microsoft-com:office:smarttags" />China, Hong Kong, Australia, Germany and Italy. 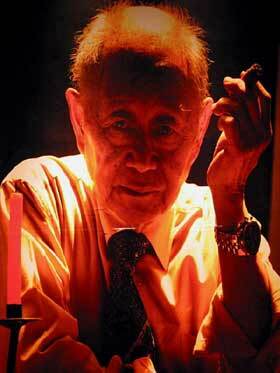 Born in 1924 in Fenghuang County, Hunan Province, Huang never went to a regular art school but he had talent and worked hard. He studied art and literature by himself and learnt from friends, society and life. Perhaps this is why he shows such initiative and vitality in his works without any set pattern. When he was young, Huang was famous for his prints, which used bold lines and an unconstrained style. Until the 1960s he devoted himself mainly to woodcuts. The period from the late 1950s to the middle 1960s marked the golden age of his woodcuts. His color woodcut prints, such as Ahshima and Spring Tide, were pleasant surprises to fellow artists with their strong folk flavor, pronounced ethnic characteristics and refreshing style. 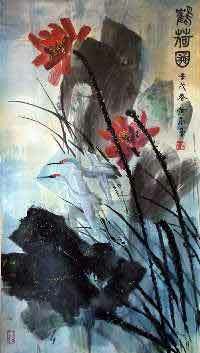 Since the seventies, Huang has produced an abundance of colored ink paintings depicting landscapes, flowers and birds using freehand techniques. There are also human figures and scenes with humorous messages or historical allusions. His fresh themes, bold strokes and dripping colors combine to make an original style in contemporary Chinese painting; while his unique style of using traditional Chinese painting techniques helped contribute to his fame. His caricatures and canvas paintings are also recognized as excellent. Plum blossoms and water lilies are two major subjects of Huang's work and he has made up to 8,000 images depicting water lilies. 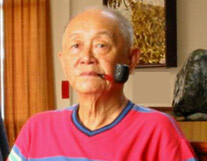 Besides paintbrushes, Huang also uses branches, his fingers and dry pulp as painting tools. He paints with amazing speed and confidence. His folk works are particularly popular in other countries. The People's Art Press published his Collection of Woodcarvings of Huang Yongyu in 1956, and he has been covered in US magazine Time, and had works published by the Hong Kong Artist's Press and the Hunan Art Press. 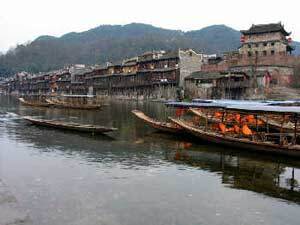 Huang's hometown Fenghuang is one of his favorite themes. For Huang, Fenghuang is not only a place of happy childhood memories, but also somewhere that provides him with artistic inspiration. Huang never forgot the narrow alleys paved with stone slabs in his hometown, where he watched craftsmen make kites and carve statues of Buddha, enjoyed folk operas, dragon -boat races and lion dances. He never forgot any of these beautiful scenes. This lotus painting shows a vivid use of color combined with a freehand depiction of leaves and background. While some regard elegance as the essence of painting, Huang particularly emphasizes strong color as seen in the water lilies here. A pond of lotuses lay in front of Huang's old home and as a result, lotuses have figured heavily in his artistic endeavors. In the 1950s Huang became the youngest teacher at the Central Academy of Fine Arts in Beijing. By the time of the Cultural Revolution, Huang was one of the leading print and ink artists in the country. He created little in the way of art during those tumultuous ten years, but his ink and wash painting Maotouying or Owl which portrays an owl with one eye closed, was criticized as an attack on socialism, as it can be seen to portray public officials turning a blind eye to wrong doings. 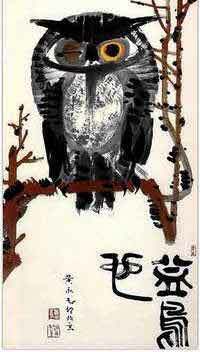 People were surprised and worried about the painting but Huang didn't feel uneasy at all even joking that the half-opened eye of an owl was a natural phenomenon. Huang has made a point of never inviting any particular people or celebrities to his exhibitions, believing everyone should have equal access to art. However he made an exception at an exhibition in Beijing in 1999. During a dark period in his life, a gardener sent Huang flowers and gave him encouragement to get him through, but they somehow lost track of each other and Huang spent years looking for him. When the two friends were reunited, Huang broke his rule and invited the gardener to one of his exhibitions as a distinguished guest. Some say Huang priced his paintings according to his mood, giving a low price while in good mood and hiking the price when in a foul one. Others say he asked for 60, 000 RMB (about US$7,489) for each square foot of art. Huang put up a notice on the wall of his house, stating that all deals made should be paid for in cash, which would later be donated to the restoration of scenic spots and pavilions in his hometown. Huang's work is still popular. His book An Old Man Who Is Older than Me still enjoys brisk sales and was on the top ten bestseller list in 2003. An exhibition of his art was held in celebration of his 80th birthday in 2004. Beginning in Beijing and finishing in Hong Kong, it featured both old and new works.